Why and How Does Jiu Jitsu Help Kids against Bullies? Before we address the issue of Bullying, we must first define it. Schools are getting blasted with complaints, and unfortunately most parents, and kids do not have the correct definition of bullying. There is a difference between Bullying and ‘Bad Behavior’, as mentioned by a school Director in Plano, Texas. The difference between the two? The number of instances in which it happens, with bullying ‘being a recurring behavior that harms its subject, mentally or physically’. A child that is pushed by ‘bad boy A’, and it only happens once, it not a bullying act. However, if that same ‘bad boy A’ pushes the same child every day during lunch, in line, he becomes a ‘Bully’. Or if a girl repeatedly spreads rumors about another girl in order to humiliate her, or keep her from having friends, she is a bully. Bullying is a huge issue in our society today. It can lead to serious problems, and sometimes tragedies if it’s not addressed correctly. In the state of Texas, did you know that if your child is pushed, and you child hits them back ( via punch or kick,) they can be charged with assault? Yes, that’s right, adding insult to injury! This is where Jiu-Jitsu comes in. It’s a well- known fact that Jiu-Jitsu is a tool to help kids stand up to bullies. But how? 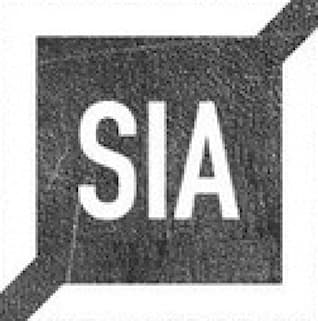 1) Building Confidence – Bullies are cowards. They identify those who lack confidence and prey on it. This way of picking victims also holds true of adult perpetrators of crime. A person/child that lacks confidence displays certain behaviors. Common ones are, not looking people in the eye when talking or walking by, shoulders hunched forward, (in a defensive, don’t see me stance), aren’t confident shaking hands, and always shuffling to the back of a group, hoping no one will notice them. 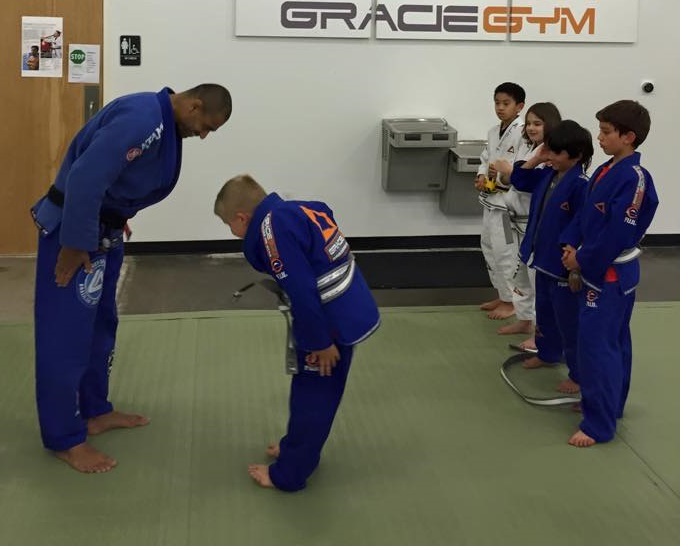 Jiu-Jitsu gives kids the confidence to stand up the first time they are approached. How? The format of the class, and time on the mat teaches many small accomplishments each day, in addition to learning to defend themselves. 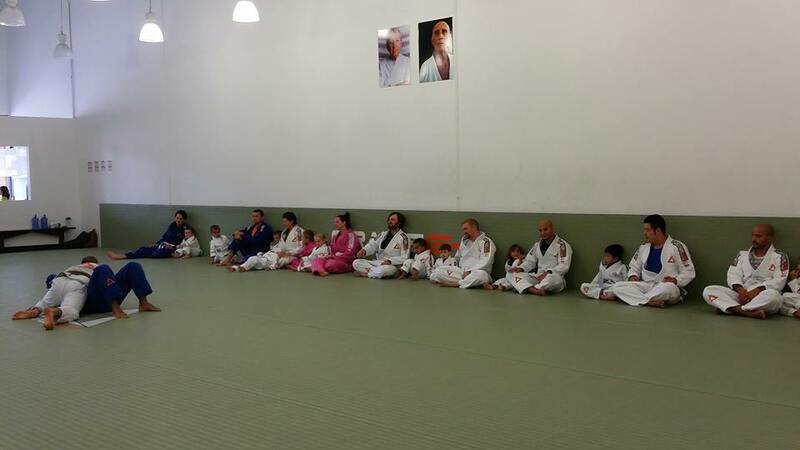 Our instructors place children at the front of the class, as an example of technique, and to watch others. This builds leadership skills, and make eye contact non-threatening. All kids shake hands with each other, and the instructor at the end of class as a sign of respect, and acknowledgement of respect, partnership, and a great workout! These items breed confident behavior off the mat. BJJ kids hold themselves more confidently, sending a ‘not an easy target’ message. But if the bully is slow on getting that message, the response of a BJJ kid to adversity is quick, and confident. The bully will know right away to back off. 2) Handling Fear of attention – Shy and introverted children do not like to be the center of attention. Some take to the mat as a safe haven, and develop into extremely confident kids after mastering techniques. Others are a bit fearful, and may even cry after a few scrapes on the mat. However support of the parent to get up, and continue, repetition, and teammates’ acceptance of them, builds the confidence they need to bloom into a confident shy child. Perseverance in training a shy child will pay off in dividends. Once again, they will no longer become natural targets for bullies. 3) Insecure Bullies or victims – an insecure, attention seeking child is usually the aggressor. They seek confrontation to gain attention they lack, or are simply disrespectful and spoiled. This breeds lack of respect for others’ feelings. The gentle art addresses insecurity, and helps that aggressive kid gain confidence, and teach them respect, due to experiences guided by good instructors and teammates on the mat. On the other hand, it provides confidence to the insecure victim as previously mentioned. 3) Respect for differences - There’s no room for prejudice on the mat. You are expected to help your team mates on the mat, as well as prove yourself. The not so greatly held ‘secret’ is that ‘ we are ALL different’. And that is normal. Each difference makes them adjust differently on the mat, but are all in the same boat, of getting and making each other better. Teammates have all backgrounds, as BJJ is a unifying art practiced by all sorts of people. This builds a bond that surpasses cultural differences. The mat translates into ‘life’, and help children work better in teams at school, for projects, or for athletics. Bullies prey on lonesome kids, not one that is able to get along with different kids. 4) The bonds of friendship - Bullies go after kids who don’t relate well to groups. Jiu-Jitsu will work as a tool and help the child make friends. Being a contact sport, where size and athleticism matters less than being able to pay attention, and follow instructions, the gentle art makes everyone fit into the group. If you don’t fear rejection from the group, you feel comfortable being yourself, and making friends. 5) Self-esteem balance - Low self-esteem is synonymous with fearful and uncomfortable kids. Bullies spot low self-steam miles away! Jiu-Jitsu creates much needed balance. Kids learn that everyone goes thru an evolution of wins and losses on the mat. And a loss in Jiu jitsu is not a defeat, but a LEARNING lesson, just as much as a win is. Thus, mat time is always building confidence as the child learns and gets better with each session on the mat. We teach that wins/losses don’t define a child. They get back up, regardless of win/loss, and keep on going. 6) Parent and Child relationship – Jiu Jitsu teaches respect for each other, and for authority. Instructors build a bridge between home and mat. The biggest weapon against bullying besides having confidence, is great communication between kids, parents, and coaches. Jiu Jitsu instructors encourage kids to deal with difficult situations by talking to their parents. Instructors become partners in education and the well-being of your children. This communication will also build a sense of confidence in the child, as they feel taken care of…parents and instructors are there for them, when needed. 7) Stress-release - Life is full of stress for kids and adults alike. Jiu-Jitsu will teach you how to deal with stressful situations on the mat, but in a safe environment. The physical exertion itself is a great stress reliever. This helps you deal with a stressful situation calmly when it happens off the mat. A Child with all stress, and no relief from daily upsets will create an extremely unhappy child where all their issues in school are magnified. This is where danger meets opportunity. Introducing a way to release stress, and all the other components that come with BJJ, will help them become a much happier, well-adjusted child. 8) Self Defense – All martial arts provide benefits that are more psychological, than physical in nature. Jiu Jitsu provides a defense that is truly realistic in situations, than any other martial art. Jiu Jitsu teaches techniques of control and submission, without necessarily having to hurt their opponent. It teaches to use the situation, and making the best of it, while not getting in trouble in school. The art is made of technical moves based on leverage and not strength. In a confrontation, the practitioner will be able to defend themselves confidently. The correct handling of bad behavior the first time, will prevent bullying from happening in the future. 9) Problem Solving – Experience on the mat teaches children that there are many ways to address the same situation. The result of a match only dictates your next move in your training strategy, and it is not a permanent label. This allows kids to get back up with confidence, that they will adjust and try something new, until it gives them the result they are looking for. In dealing with bullies, these children can look at a bully as a problem, and how to resolve the issue. They will likely communicate with parents, or treat the bully in a manner that will show they are not an easy target. 10) Reputation – Do you know what happens to a bully when they hear a kid is training Jiu Jitsu? They run the other way! They target the ‘weak’, and someone that trains in a combat sport such as BJJ, will not fit that category. The confidence built with the practice of Jiu Jitsu is priceless. In all the benefits for preventing bullying, confidence permeates every aspect of prevention. Gracie Gym offers training in Brazilian Jiu Jitsu, with a training curriculum created by the family that invented the art. We have seen children blossom before us on the mat. 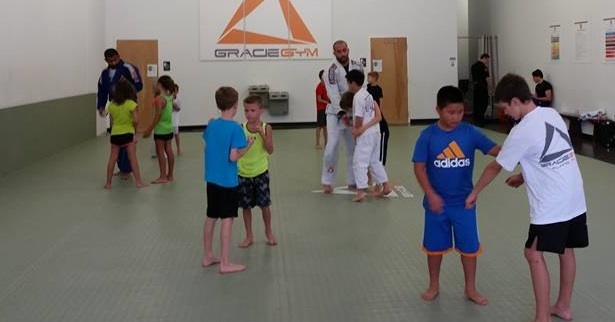 So, if your child is not really into team sports, or other individual sports, and have self-esteem and confidence issues, Gracie Gym is here to help. If your child is into sports, and want additional conditioning in the off-season, this is a challenging sport that will help their main sport. Jiu Jitsu is for everyone! We train kids from the age of 4 until adults in their 80’s. The fastest growing group, is that of parents training with their kids! This generates a great love for the sport, and creates a bond that is unequaled by any other athletic activity in existence. So come join us on the mat, at Gracie Gym.